Over New Year and at half term, the Oak Hall team take over the traditional Swiss Hotel Staubbach. With its ideal location in the centre of the chocolate- box village of Lauterbrunnen, the hotel is close to all the local amenities and the train station for easy access to the slopes. A secure ski locker is provided at the station for the use of all hotel guests. The famously picturesque town of Wengen is a short train ride away. This village, where there are almost no cars, is accessible in the winter only by the mountain railway. Here we can gaze on the mountain vistas that surround or enjoy a hot drink and pastry at the end of the ski day. From the hotel dining room there are stunning views of the Staubbach Falls, one of the highest free falling waterfalls in Europe. The lounge area provides a relaxing space after skiing. If you would prefer to stay in our Oak Hall chalet in the same village, and with availability throughout the season, please click here. The family style dining room is used for breakfast and dinner. Packed lunches are provided to be enjoyed on the slopes. Complimentary refreshments are always available, including filter coffee at breakfast. The bedrooms are comfortable and spacious with fine quality bed linen and towels. They all have en-suite facilities which have been recently renovated. Under the mighty Eiger and Jungfrau mountains, this is a top alpine region. 213km of prepared pistes, amazing scenery and plenty of sunshine make this an exceptional location for winter sports. The network of 45 lifts guarantees uninterrupted enjoyment of 64 interlinked runs. The Kleine Scheidegg area provides endless variety for those wanting an exhilarating experience. From challenging blacks beneath the Eiger’s north face for experts to easy blues through winding tree-lined paths for beginners. This is an exceptional ski area. With the Wengen/Lauberhorn World Cup held here each year, it is a favourite snowsport resort for many! ... and even more at Mürren-Schilthorn! For many years we have found Lauterbrunnen to be perfectly placed for also exploring the pistes above the picturesque village of Mürren. From Mürren the lift system provides a full variety of runs, rising to the famous and demanding James Bond Schilthorn black run that starts amidst stunning views at 2,971m. With a 2,171m descent all the way back to Lauterbrunnen, this is the route of the world famous Inferno Race. This 15km course carves through tricky ‘S’ bends and snow-covered woodlands. The winning competitors take just 15 minutes for this descent but some of us may need a little longer! From our chalet in Lauterbrunnen there are a wide variety of winter walks as well as the chance to travel through the Eiger to the highest railway station in Europe - the world famous Jungfraujoch. For a change from the slopes, the local railways offer a variety of excursions that enable you to visit some of the most beautiful scenes in the Swiss Alps including the lakeside town of Interlaken. Take the mountain train to Grindelwald, Wengen or Mürren for ice-skating, curling, indoor swimming pools, saunas and fitness rooms. In Lauterbrunnen, we can choose between a lift pass for the Jungfrau Region or one that covers Grindelwald and Wengen. 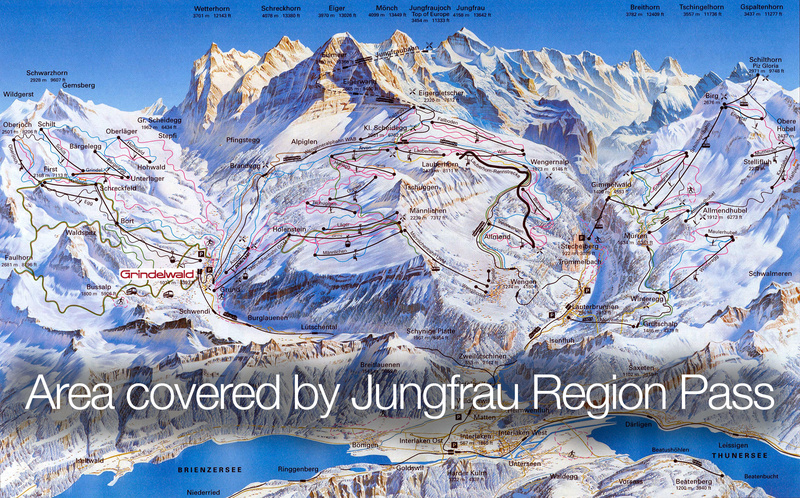 The Jungfrau Region pass costs about 20% more than the Grindelwald and Wengen pass. 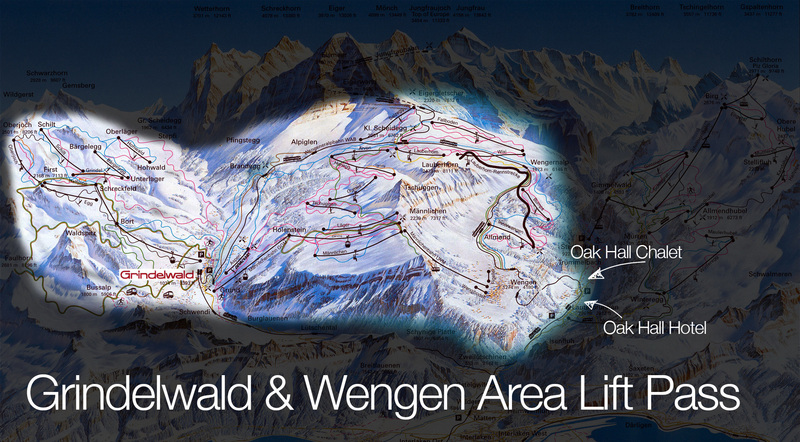 All Oak Hall lessons can be offered in the Grindelwald and Wengen area. Click here for a map of the Grindelwald and Wengen area and please click here for a map of the Jungfrau Region. More about ski passes with Oak Hall can be found here.